ISTANBUL, Turkey (CNN) -- Turkey's Foreign Ministry summoned Israel's ambassador to the Turkish capital of Ankara on Saturday to issue a formal complaint over a top Israeli commander's reported remarks criticizing Turkey. Recep Tayyip Erdogan leaves the stage at a conference last month as Shimon Peres sits, left. The complaint is part of the escalating war of words between the two regional allies, stemming from Turkey's outspoken criticism of the recent conflict in Gaza. The Turkish Foreign Ministry said Saturday that it had requested an "urgent explanation" from Ambassador Gabby Levy for recent remarks reportedly made by a top Israeli military commander. According to the Israeli newspaper Ha'aretz, Maj. Gen. Avi Mizrahi told an international conference that Turkish Prime Minister Recep Tayyip Erdogan should "look in the mirror" before criticizing Israel. Mizrahi pointed to Turkey's treatment of its long-oppressed Kurdish minority and the ongoing Turkish military occupation in northern Cyprus, Ha'aretz reported. And, in a separate statement issued Saturday, the Turkish military called the Israeli general's comments "unacceptable," adding, "We expect the Israeli General Staff, which we think gives importance to relations with the Turkish Armed Forces, to clarify the issue." Tensions have increased between Turkey and Israel since last month, when Erdogan stormed off stage at a conference in Davos, Switzerland. Erdogan objected to Israeli Prime Minister Shimon Peres' passionate defense of Israel's 22-day military operation in Gaza, which left more than 1,300 Palestinians dead. Thirteen Israelis, including 10 soldiers, were killed. For the past decade, Turkey and Israel have enjoyed close military and economic ties. The Israeli military often conducts exercises around the Turkish city of Konya. Israeli tourists flock to Turkey's Mediterranean Sea resorts, and bilateral trade has increased dramatically since Erdogan's ruling AK Party first won national elections in 2002. 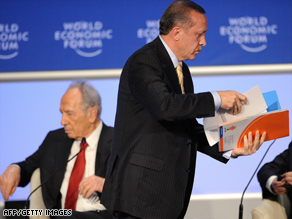 As a result, audience members were shocked last month when Erdogan lost his temper while participating in a panel discussion of the recent Gaza conflict in Davos. Before storming off stage, Erdogan told the Israeli president, "When it comes to killing, you know killing very well. I know how you hit, kill children on the beaches." Erdogan has been unapologetic about his outburst. While campaigning for municipal elections to be held in Turkey next month, the prime minister told reporters that the results of Israel's recent elections "painted a very dark picture" for the future of the region, Reuters reported.